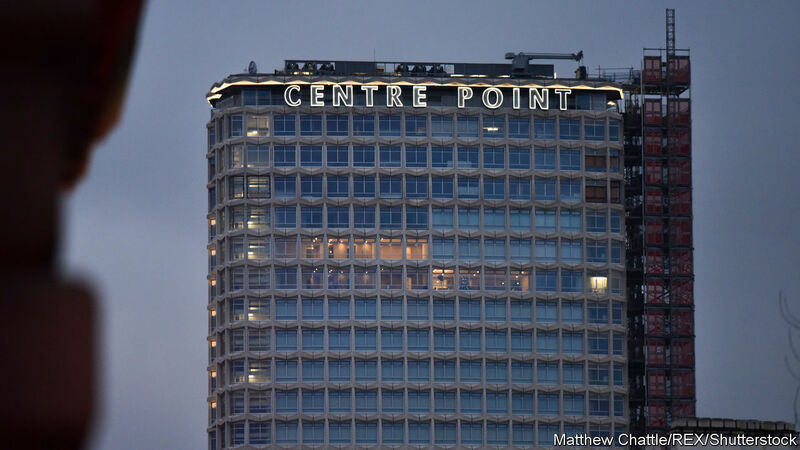 CENTRE POINT, a tower that looms over central London, was empty for so long in the 1970s that it lent its name to a homelessness charity. Recently it was converted from offices to flats. Half are yet to find buyers. So the developer has taken them off the market pending a clearing of the political fog over Britain. Its boss complained to Estates Gazette, a trade paper, of bids that were “detached from reality”. One-bedroom flats were on sale for £1.8m ($2.4m). Even flats with less hefty price tags have been hard to shift lately. Property prices in London are falling. Sellers are waiting for better prices. It is tempting to put all the blame on Brexit, but that would ignore the broader picture. House prices in big global cities increasingly move together. What happens in London has a growing influence on what happens in New York, Toronto and Sydney—and vice versa. And trouble is brewing in some of these other markets, too. Property used to be thought of as an inflation hedge. But in recent years it has become a substitute for low-yielding Treasury bonds—a safe asset in which the globally mobile can store their wealth. After years of rapid price rises, houses in the most favoured markets are overvalued. Rising bond yields, tighter mortgage credit and shifting politics are now combining to push prices down. The value of homes in the posher parts of global cities move in sync because they have become a distinct asset class. Private-equity firms and investment trusts, not just individuals, own them. Prices in such cities are explained more by global factors, such as the yields on the safest government bonds, than by local conditions. This global influence is particularly marked in financial centres that are open to capital flows, such as London, New York, Toronto and Sydney. It has extended into smaller European cities, such as Amsterdam. Demand from emerging markets such as China and Russia has been growing. Buyers are willing to pay steeply to secure a safe place for their savings—or a bolthole for themselves. Cristian Badarinza of the National University of Singapore and Tarun Ramadorai of Imperial College London have shown that political trouble in Russia, parts of Africa and the Middle East predicts a rise in the price of prime London property. The same sort of influence is also found in less ritzy neighbourhoods, says Mr Ramadorai. For instance, property prices in Hounslow and Southall, which have lots of settlers from South Asia, picked up in the early 2000s, a period of political tensions in India. Foreign demand has spillovers. If an oligarch buys a house, it drives up the prices of smaller properties nearby. A paper by Dragana Cvijanovic of the University of North Carolina and Christophe Spaenjers of HEC Paris finds similar effects in Paris’s property market. Foreign buyers, mostly from China, have been a force behind booms in the big cities of Australia and Canada. But the tide has changed. Global cities look awfully dear. The rental yield on investment homes worldwide fell below 5% for the first time ever in 2016, according to MSCI IPD, a financial-information firm. 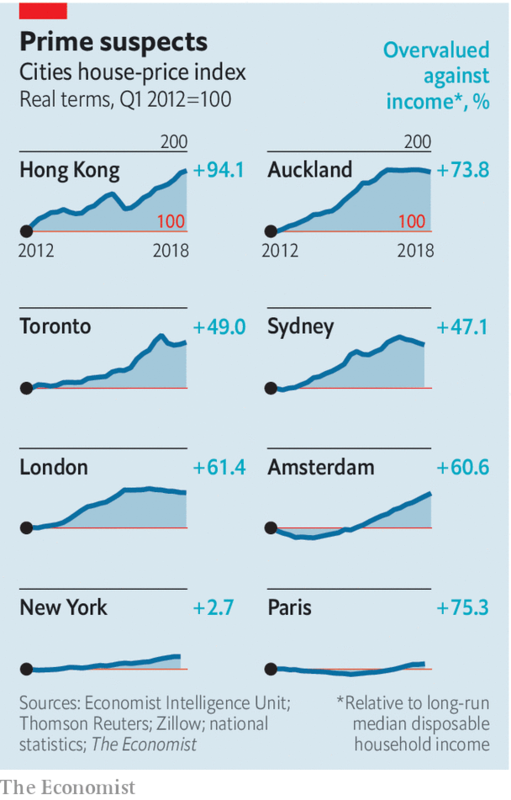 House prices relative to incomes are well above their long-run average in Amsterdam, Auckland, London, Paris, Sydney and Toronto (see chart). And prices are falling in some of the dearer cities, in response to a variety of forces. The yield on Treasury bonds, the world’s benchmark safe asset, is rising. A tightening of credit standards on mortgages in Australia and Canada has squeezed housing in cities there. Uncertainty about Brexit has made London a place of political risk rather than a refuge from it. Meanwhile, capital is moving less freely. Governments are charier of Russian money. China is shaking down its super-rich for taxes and is zealous in its policing of capital outflows. A corollary of stronger links between global cities is a kind of “waterbed” effect. For instance, when taxes were levied on foreign homebuyers in Vancouver in 2016, the market cooled, but Toronto took off. There are buyers who will compare prices in, say, Mayfair in London and Park Avenue, New York. They look for value. But it is vanishingly scarce. The market is turning. Those who bought at the peak, or are hoping to sell, will slowly adjust to a new reality. When Texas-based Tricon Energy wanted to buy polymers from India’s Reliance Energy, the two companies avoided the usual rigmarole of phone calls, couriered documents and emails by logging on to a new blockchain system called Voltron. Within minutes they had completed negotiations on the terms of the sale and then secured a letter of credit and advice from lenders ING and HSBC to complete the transaction, which was finalised on Friday. This was one of the first examples of a real-life trade deal being handled by one of many new platforms being developed by banks to use blockchain technology— which underpins cryptocurrencies such as bitcoin — to save money and time in the centuries-old trade finance market. HSBC, Standard Chartered, Bank of China, Deutsche Bank, Société Générale and UBS, among many others, are looking to a handful of platforms to help speed up, simplify and reduce risk in the $16tn in global trade done annually. After several years of development work and testing, the first real-life transactions passing over these systems indicate that banks are getting closer to their goal of starting to make money from the investments they have patiently bankrolled. Trade finance is still mostly based on paper, such as bills of lading or letters of credit, being sent by fax or post around the world, and seems to many bankers to be crying out for modernisation. Combining shared databases and cryptography, blockchain technology allows multiple parties to have simultaneous access to a constantly updated digital ledger that cannot be altered. Banks hope the decentralised nature of the technology, which draws on and verifies information from thousands of different sources, will eliminate vast piles of paper documents and unlock up to $2bn in extra financing business within eight years. Yet getting viable businesses off the ground has proved challenging. The platforms are struggling to link up with the diverse range of parties that participate in global trade, many of which are developing their own technology. Shipping companies such as AP Moller-Maersk and Hyundai Merchant Marine are testing their own systems, which are not guaranteed to mesh with those of the banks. When banks invest in new systems, they traditionally expect to see returns within defined periods of time, or at least be able to predict when the first revenues will be generated, said Sen Ganesh, partner at consultants Bain & Company. A timetable for returns from blockchain trade finance, however, has proved uncertain. The ability to eke out early returns on a system could depend on which segment of the trade industry it is focused on. Documentary trade, which includes letters of credit and involves banks taking on payment risks for the buyers of goods, already has a high level of standardisation that makes it more difficult to disrupt, said Alessio Botta, a partner at consultants McKinsey. But supplier-originated finance, in which suppliers sell their accounts receivables to generate liquidity, has no common standard and platforms focused on this business are expected to find higher demand for new products, Mr Botta said. The Voltron platform, backed by eight banks, announced in May that it had moved from tests to live business, executing a soyabeans trade for US agricultural group Cargill. The system focuses on documentary trade products such as letters of credit. Marco Polo, a platform designed for receivables financing and backed by another group of lenders, plans to launch this year. At least six other competing systems are expected to go into production this year or in 2019. We.Trade , backed by a group of European banks, and the Indian bank-backed Finacle Trade Connect, for example both do invoice finance. Large sums are at stake. Global annual revenues for documentary trade finance are about $25bn, while supplier-originated finance comprises another $25bn-$30bn, McKinsey estimates. Bain & Co predicts new products for documentary trade will boost annual revenues for banks by $2bn by 2026, while driving up trade volume by $1.1tn. “If we make the process more efficient, especially around financing, the need will be there, and there will be customers who will want access to letters of credit so they can receive financing faster,” said Vinay Mendonca, global head of product and propositions for trade and receivables finance at HSBC. But the gap between a few live transactions and widespread commercial usage remains wide. The Cargill soyabeans trade, for example, was considered a live transaction because it could be replicated again if the same companies and banks were involved. But ports and logistics groups will not be able to join until they onboard the technology, which will be time-consuming and costly for smaller companies. “You have the transporters, who have been forgotten by the banks but are also developing their own consortiums,” said Cécile André Leruste, managing director for banking in Europe at consultants Accenture. Banks, meanwhile, are betting on multiple blockchain systems. HSBC, for example, is involved in at least four different trade finance platforms, as is Standard Chartered. Bankers expect the most powerful systems to be able to connect with each other, while some platforms will eventually die off. Last Thursday NVIDIA (NASDAQ:NVDA) issued revenue guidance for the current quarter of $2.7 billion, falling well short of analysts' consensus estimates of $3.4 billion. The culprit? The deflating bitcoin bubble! Some explanations for earnings and revenue warnings you just can’t make up. The global cryptocurrency mania – not only for bitcoin but similar absurdities – led to strong demand for graphics processing units (GPUs), which NVIDIA is a leader in, as they are used to run the computations necessary to “mine” cryptocurrencies. As the air has rapidly left the global crypto bubble, mining those worthless lines of code has gotten less lucrative and hence the demand for GPUs has rapidly declined! Graphs are for illustrative and discussion purposes only. Please read important disclosures at the end of this commentary. As I’ve explained previously several times in this column, the term “market cap” when used to describe a cryptocurrency is absurd. Market cap is short for “market capitalization,” or the total worth of all publicly traded stock of an operating company. It is supposed to discount all earnings (or cash flows) as far as all investors in the company’s stock (dubbed “the market”) can see and thus value the company that way. The way we know bitcoin, and all other cryptos, are a bubble, is by making the glaringly obvious observation that they cannot produce any cash flow whatsoever, making the term market cap absurd. That’s not to say that blockchain as a technology cannot be useful without the unnecessary step of buying a digital token called bitcoin, which is calculated to limit the amount of bitcoins at 21 million and thus make their price rise as more poor souls cram themselves into this line of code in search of riches. (For more Marketwatch December 19, 2017, “Opinion: Bitcoin is perfectly tracking major bubble phases”). As history has proven on multiple occasions, most bubbles end with the majority of investors losing massive amounts of money as they hold and hope for the bubble to reflate. Regrettably, after bubbles pop they can take decades to recover and “take out” the bubble price high, or, worst-case scenario, disappear. I think bitcoin will be a worst-case scenario situation. A case in point is Amazon.com (NASDAQ:AMZN), which made its founder Jeff Bezos the richest man in the world. It used to be a bubble (rapidly rising price with no earnings). But that is no longer the case as it has rising sales and earnings and is expanding into new businesses. Amazon’s sales were rising in 1997-2000 but so were its losses. 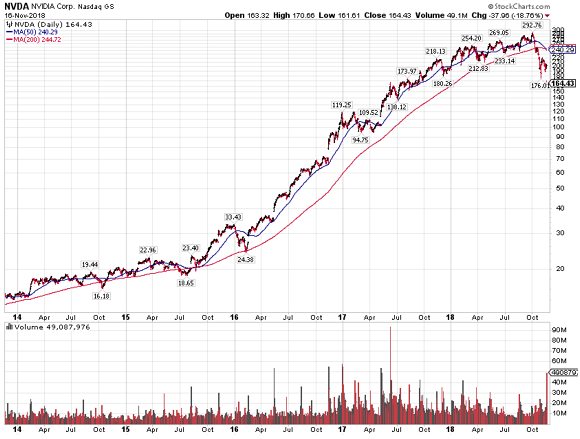 The more sales it had, the more money it lost, so the stock got overvalued in the 1999 dot.com bubble. 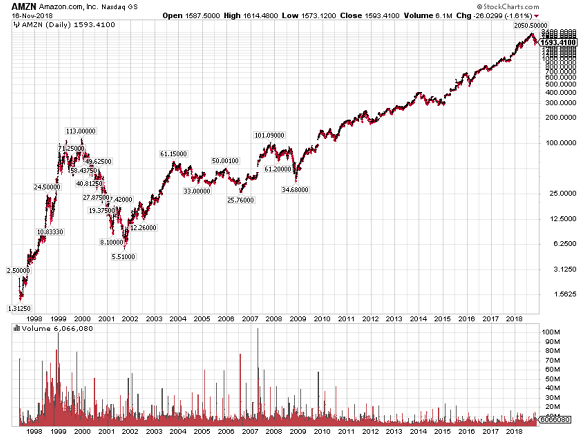 That’s why it went from $113 to $5.51 after the dot.com bubble burst in 2000-02. Then, when Bezos turned it around, Amazon became the company that had institutional and board support for the longest of any large company without making any money, plowing all cash flows into the growth of the business. The stock went parabolic without becoming a bubble. In fiscal year 2018, AMZN is set to have $233.37 billion in sales, while in 2019 they are estimated to rise 21.3% to $293.11 billion, based on consensus analyst estimates. Then, AMZN will be more than half the size of Walmart (NYSE:WMT), the largest retailer in the world, but growing much faster than Walmart. That’s why Jeff Bezos is the richest man in the world and likely to grow richer, if he doesn't get broken up by the Trump administration or any later administration for that matter, which is not the course of action that I am rooting for as a satisfied customer. After all, they did that to Standard Oil and AT&T. My job requires me to talk to a lot of clients about the bigger picture when it comes to their investments. Therefore, I am a lot more macro-oriented and try to see through short-term market gyrations. But, if one is around charts for a couple of decades in the trenches of the fascinating world of finance, one sooner or later gets to know something about the use of charts. To be absolutely clear, I will never make an investment by looking at a chart alone. I have to understand what makes the chart “tick” and what makes an investment, as in the case of specific stocks, rise or fall. Since there never will be any profits, or cash flows for that matter, generated by bitcoin, ever, it is conceivable that it will go to zero, nada, or nil. It does not take a genius to figure that one out. That said, let me put my amateur technician’s hat on. It appears that bitcoin has broken below a major support level at 6000. The chart shows declining peaks and even lows that got taken out last week at that key level. If one reads the chart as 6000 being the climactic low that was hit after the top was set on December 18, 2017 and 12000 is the first major rebound off that climactic low, then the bitcoin chart has formed a “bearish wedge,” or a “descending triangle” pointing from 12000 to 6000. The measured move of that breakdown is 6000 below the point of breakdown (or the width of the triangle). In other words, bitcoin’s own chart is suggesting that it's going to zero. How about them apples? Labour leader Jeremy Corbyn believes that politics have left young people behind. In an interview with DER SPIEGEL, he speaks about Brexit, the crisis of social democracy in Europe and the uphill battle to unite his party. The man upon whom the hopes of young men and women in Britain rest enjoys taking pictures of drain covers and making jam. He wears baggy blazers and, when necessary, smuggles English cheese into his Mexican vacation lodgings. In other words, he leads the averagely eccentric lifestyle of your standard British retiree. Except that Jeremy Corbyn, 69, has his sights set on becoming the next prime minister of the United Kingdom. Ever since the man from the London borough of Islington became the surprise Labour leader in 2015, the party has been experiencing an unprecedented boom. Not unlike Bernie Sanders in the United States, Corbyn's decidedly socialist and pacifist positions have been received enthusiastically by mostly young voters. With its 540,000 members, Labour is now the largest political party in the European Union. In the 2017 election, it received 40 percent of the vote, despite significant attacks on the party from the British media and a bitter internal battle. Since then, left-wing and social democratic parties from across Europe have been making pilgrimages to London to learn the secret to Corbyn's unlikely success. DER SPIEGEL: Mr. Corbyn, when you look across Europe at the moment, do you fear that social democracy is doomed? Corbyn: Not at all. Look at Portugal where the Socialist Party has formed a successful left-wing government. Also the Swedish Social Democratic Party did comparatively well in the last election. DER SPIEGEL: These are the last bastions. In Germany, France, the Netherlands and elsewhere, social democrats are on their way to becoming splinter parties. Why are they doing so poorly? Corbyn: I think the main point is how you deal with the economic crisis of 2008. Do you continue to allow austerity to dominate and manage an economy which, in effect, is redistributing wealth in the wrong way or do you offer an alternative? I think left parties that are putting forward a coherent anti-austerity alternative will get huge support. DER SPIEGEL: At the moment, though, it is right-wing populist parties across Europe that are getting significant support. Corbyn: When communities become disillusioned with politicians and politics, it can be extremely dangerous. And hence, I find the rise of the far right in Austria and Germany very troubling and very concerning. At least the AfD (Germany's right-wing populist Alternative for Germany party) didn't hasn't grown any further in the polls recently, but I do find the rise of this party quite frightening. DER SPIEGEL: The decline of social democracy started after figures like Tony Blair and Gerhard Schröder were in government. Is that just coincidence? Corbyn: What Tony Blair wanted to do was turn the traditional social democracy into what he called a third way. DER SPIEGEL: Which led to him winning by a landslide in 1997. Corbyn: Yes, but he moved the Labour Party to the right. I was never a supporter of this path. I supported the investment in health and education, which was very good. I disagreed on the Iraq War in particular, but also on the idea that you could run public services through private finance. DER SPIEGEL: Your answer is a sharp turn to the left? Corbyn: What we're offering here are coherent policies. It's the values behind it that are so important. The values that you work for the entirety of society and don't blame minorities, that you invest in education, but above all, that you give people hope. I really think many people across Europe need the perspective that they will be able to achieve something in their lives because the levels of depression in post-industrial areas is huge. The levels of underemployment, short-term employment and insecure employment are huge. And I think that is very dangerous to society. What we're saying is that there has to be a realignment of wealth within our society. DER SPIEGEL: Yet the current level of unemployment in Britain is the lowest it has been since 1975. Despite Brexit, the economy is growing. Corbyn: That masks the fact that there are 1 million people on zero-hour contracts (Eds. Note: contracts that do not guarantee a minimum amount of work) and that real wages have been frozen now for 10 years. Almost 4 million people accessed food banks last year in the sixth richest country in the world. The Conservatives tend to measure everything by the prosperous parts of London and the southeast. It's simply not the case with the rest of the country. We have the lowest levels of wages paid in the East Midlands, which is less than two hours from London by train. The lowest levels of investment are in the northeast. DER SPIEGEL: Is that why Labour received 40 percent of the vote in last year's election? Corbyn: We addressed the worries of the majority in our manifesto, yeah. And we're campaigning in a different way. We're doing community campaigning, we involve our members much more in policy making. Together, we're developing ideas like an overarching national education service. It's a completely novel idea in Britain, where education has traditionally been atomized between school, local authority, quasi-independent universities and so on. And we obviously work to get our message across in any way that we can. DER SPIEGEL: By bypassing the mainstream media, as you refer to it. Corbyn: The most hostile area for us is the mainstream print media, which has been unbelievably hostile. Since I became Labour leader three years ago, 86 percent of reporting about my leadership has been negative by the mainstream media. We challenge that in whatever way we can. We do much better on social media and on broadcast media. DER SPIEGEL: To be fair to the print media, you don't need journalists to badmouth you. Some of your fiercest adversaries can be found among Labour delegates to the House of Commons. Corbyn: The party is more united than you think. Almost 14,000 people came to our last conference in Liverpool. That's the biggest attendance ever to a political conference in Britain. And the party came to fairly agreed positions on most things. There isn't a huge split. DER SPIEGEL: Which is why I referred specifically to Labour MPs, a group collectively known as the Parliamentary Labour Party. A significant number of them would like to get rid of you sooner rather than later. Corbyn: Some members of the Parliamentary Labour Party have been slower to come onboard than others, shall we say? DER SPIEGEL: Why does the old guard despise your left-wing politics so passionately? Corbyn: I am afraid you'll have to ask them that question, really. I reach out to all -- all the time. DER SPIEGEL: Rumor has it that old Blairites and Labour centrists are in the process of forming a new party. Would it be easier for you if your adversaries within the party were to leave? Corbyn: No, I don't want the party to be split because any split would be dangerous for the future of all of us. I want them to stay together and recognize that, unless we offer an inclusive radical alternative to what this Tory government is doing, we're not going to win the election. We're offering that radical alternative. DER SPIEGEL: It is one that includes the nationalization of the railways and the electrical grid, more workers' rights and a massive redistribution of wealth from the top to the bottom. Corbyn: Our policies are sensible, inclusive, and they are actually quite mainstream. A majority of Britons support bringing the railway back into public ownership. DER SPIEGEL: In your 35 years as an MP, you have gained a reputation for being a party rebel. You have voted against your own party 400 times. Corbyn: Oh, I think much more than that. DER SPIEGEL: Yet under your leadership, Labour rebels have occasionally been sanctioned quite harshly. Is that not a paradox? Corbyn: Nobody has been sanctioned for their votes. We are not into sanctioning people for their views. We sanction people for their behavior and for false allegations. DER SPIEGEL: Members of your own party have also accused you of tolerating anti-Semitism. Do you? Corbyn: No, absolutely not. Anti-Semitism is a disgusting form of racism. I am implacably opposed to it. There is no place for it in our party and it must be eradicated from society. We will take whatever measures necessary to tackle anti-Semitism head on and guarantee the security of Jewish life in the UK. DER SPIEGEL: Not just Labour, but the whole country is extremely divided at the moment -- not least because of Brexit. If you could stop Brexit, would you? Corbyn: We can't stop it. The referendum took place. Article 50 has been triggered. What we can do is recognize the reasons why people voted Leave. DER SPIEGEL: And they are? Corbyn: I think a lot of people have been totally angered by the way in which their communities have been left behind. We had high Leave votes in the most left-behind areas of the country. In a lot of deprived areas, working conditions have deteriorated over the decades, protected by European legislation. Indeed, we would enhance workers' rights, where the Conservative Party wants to go in another direction of a largely deregulated economy. DER SPIEGEL: Wouldn't you face pretty much the same problems as Prime Minister Theresa May if you were in charge of the Brexit negotiations? Corbyn: No, because we wouldn't be trying to face towards the deregulated economy of the United States, which the one wing of the Tory Party is trying to do all the time. We would want to make a new and comprehensive customs union with the European Union, one that would obviously protect the Irish border -- that's crucial -- but also ensure that our supply chains worked in both directions. People voted Leave, or they voted Remain, but nobody voted to lose their job. Nobody voted to reduce their living standards or working conditions. DER SPIEGEL: Some people have argued that if Labour had had a pro-EU leader, the result of the Brexit referendum would have been different. What would the EU have to look like for you to support it? Corbyn: I've been critical of the competitions policy in Europe and the move towards free market, and obviously critical in the past of their treatment of Greece, although that was mostly the eurozone that did that. My idea is of a social Europe with inclusive societies that work for everyone and not just for a few. Corbyn: Well, as you probably gathered from following me, I'm not really in favor of neo-liberal economics. DER SPIEGEL: Looking at the almost impossible task facing Theresa May, that of sealing a deal not only with Brussels but also with her own party, do you sometimes feel sorry for her? Corbyn: I am a decent human being, I feel sorry for anyone in distress. But the best way for anyone to alleviate distress is to take yourself away from the source of it. DER SPIEGEL: Why is it that so many young people flock to you? Corbyn: It's not a personal thing. It's about us as parties and movements offering some hope. Young people never turned off politics. Politics turned off young people because it didn't offer anything to them. I grew up in the 1950s and '60s and I always believed that I would probably have a better life than my parents had. And my parents were not poor. The turning point was the politics endorsed by Ronald Reagan and Margaret Thatcher. Their message was that the young had to pay for education, pay for health, pay for pensions, that society doesn't really care about them. And that it's all a race. DER SPIEGEL: And now you want to go back to the future? Corbyn: What we've been saying on both sides of the Atlantic is about redistribution of wealth and power. Bernie Sanders has quite a good line. He says: "America can afford anything except the inequality it's got." DER SPIEGEL: You will turn 70 next year. Are you planning to stand in the next general election? Corbyn: I'm very young. I'm very healthy. I run. I'm a vegetarian. I eat porridge every morning. I don't smoke. I don't drink. I don't do anything bad. I am sorry if that makes me sound boring. DER SPIEGEL: Mr. Corbyn, thank you very much for this interview. Almost everyone looks for a political solution to problems. However, once a Deep State situation has taken over, only a revolution or a dictatorship can turn it around, and probably only in a small country. Maybe you’re thinking you should get behind somebody like Ron Paul (I didn’t say Rand Paul), should such a person materialize. That would be futile. First, there would be a “sit-down” with the top dogs of the Praetorian agencies and a bunch of Pentagon officers to explain the way things work. Then, should he survive, he would be impeached by the running dogs of Congress. Then, should he survive, whipped dog Americans would revolt at the prospect of having their doggy dishes broken. Remember, your fellow Americans not only elected Obama, but re-elected him. Do you expect they’ll be more rational as the Greater Depression deepens? Maybe you think the police and the military will somehow help. Forget it…they’re part of the problem. They’re here to protect and serve their colleagues first, then their employer (the State), and only then the public. But the whipped dog likes to parrot: “Thank you for your service.” Which is further proof that there’s no hope. So what should you do, based on all this? For one thing, don’t waste your time and money trying to change the course of history. Trying to stop the little snowball rolling down the mountainside might have worked many decades ago, but now it’s turned into a gigantic avalanche that’s going to smash the village at the bottom of the valley. I suggest you get out of the way. 1. Allow the collapse of all zombie corporations – banks, brokers, insurers, and government contractors. The real wealth they supposedly own will still exist. 2. Abolish all regulatory agencies. Although Boobus americanus believes they exist to protect him, and that may have been an intention when they were created, they, at best, serve the industries they regulate. The U.S. Food and Drug Administration, for instance, kills more Americans every year than does the Department of Defense in a typical decade. The SEC, the Swindlers Encouragement Consortium, lulls the average investor into thinking he’s protected. They, and other agencies, extract scores of billions out of the economy to feed useless mouths in return for throwing sand in the gears of the economy. 3. Abolish the Fed…you need a strong currency to encourage saving. Actually, you don’t need a currency at all. Gold is vastly better as money. 4. Cut the size of the military by 90% and abolish the Praetorian agencies. In addition to bankrupting the U.S., the military is now a huge domestic danger, even while it’s mainly an instrument for creating enemies abroad. 5. Sell essentially all U.S. government assets. Although some actually have value, they are all a drain on the economy. For instance, the U.S. Postal Service loses $5 billion a year; Amtrak loses another billion or so per year. The Interstate Highway System, airports and the air-traffic-control system, the 650 million acres of U.S. government land, and many thousands of other assets should all be distributed in shares or sold. This would liberate an immense amount of dead capital. The proceeds could be used to partially satisfy some government obligations. 6. Eliminate the income tax, as a start, which will be possible if the other six things are done. 7. Default on the national debt and contingent liabilities. That’s somewhere between $21 trillion and $200 trillion. There are at least three reasons for that. First is to avoid turning future generations into serfs. Second is to punish those who have enabled the State by lending it money. Third is to make it impossible for the State to borrow in the future, at least for a while. I like this program from a practical point of view, because when a structure is about to collapse, it’s much wiser to conduct a controlled demolition than to just let it fall when no one expects it. But I also like it from a philosophical point of view because, as Nietzsche observed, that which is falling deserves to be pushed. There are, however, two very important reasons for optimism: science and savings. Science: Science and technology are the mainsprings of progress, and there are more scientists and engineers alive today than have lived in all previous history put together. Unfortunately for Western civilization however, most of them are Asians. Most American PhDs aren’t in Rocket Science but Political Science, or maybe Gender Studies. Nonetheless, the advancement of science offers some reason to believe that not only is all this gloom and doom poppycock, but that the future will not only be better than you imagine, but, hopefully, better than you can imagine. Savings: Things can recover quickly because technology and skills don’t vanish overnight. Everybody but university economists knows that if you want to avoid starving to death, you have to produce more than you consume and save the difference. The problem is twofold, however. Most Americans have no savings. To the contrary, they have lots of debt. And debt means you’re either consuming someone else’s savings or mortgaging your own future. Worse, science today is capital intensive. With no capital, you’ve got no science. Worse yet, if the U.S. actually destroys the dollar, it will wipe out the capital of prudent savers and reward society’s grasshoppers. Until they starve. Of course, as Adam Smith said, there’s a lot of ruin in a nation. It took Rome several centuries to collapse. And look at how quickly China recovered from decades of truly criminal mismanagement. But let’s return to the real world. What should you do? And how will this all end? From a personal standpoint, you should preserve capital by owning significant assets outside your native country, because as severe as market risks are, your political risks are much greater. 1. I suggest foreign real estate in a country where you’re viewed as an investor to be courted, rather than a milk cow. Or maybe a beef cow. 2. Gold. It’s no longer at giveaway prices, but remains the only financial asset that’s not someone else’s liability. 3. Look for depressed speculations. At the moment, my favorites are resource companies, which are down more than 90% as a group. And look to go long on commodities in general. Soybeans, wheat, corn, sugar, coffee, copper, and silver are historically undervalued. 4. Short bubbles that are about to burst, like bonds in general, and Japanese bonds denominated in yen, in particular. If you have a collectible car from the ‘60s that you hold as a financial asset, hit the bid tomorrow morning. Same if you have expensive property in London, New York, Sydney, Auckland, Hong Kong, or Shanghai, among other places. From a macro standpoint, don’t worry too much. The planet has been here for 4.5 billion years and it has a life of its own. You don’t have to do anything to save the world. Instead, rely on the Second Law of Thermodynamics. There are very few laws I believe in, but this is one of them. There are many ways of stating the law, and its corollaries, but this isn’t an essay on physics. In essence, it states that all systems wind down over time. Entropy conquers all. That all systems collapse without constant new inputs of energy. And that the larger and more complex a system becomes, the more energy it requires. The Second Law is why nothing lasts forever. In human affairs, you can say stupidity is a corollary to the Second Law, in that it throws sand in the gears of society and accelerates the tendency of things to collapse. But stupidity doesn’t always mean low intelligence…most of the destructive sociopaths acting as top dogs have very high IQs. I want to draw your attention to more useful definitions of stupidity. One definition of stupidity is an inability to predict not just the immediate and direct consequences of an action (which a typical six-year-old can do) but also to fail to predict the indirect and delayed consequences. An even more helpful definition is: Stupidity is an unwitting tendency towards self-destruction. It’s why operations run by bad people always go bad. 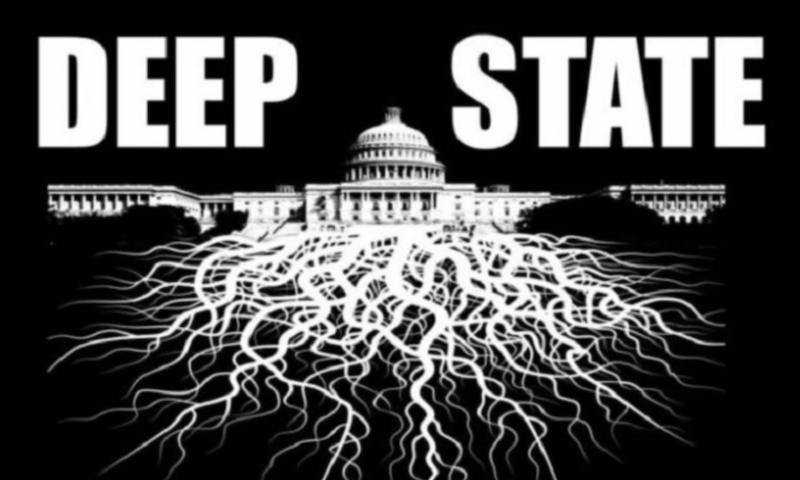 And why, since the Deep State is run by bad people – the sociopaths who are actively drawn to it – it will necessarily collapse. The Second Law not only assures that the Deep State will collapse but, given enough time, that all “End of the World” predictions will eventually be right, up to the heat death of the universe itself. It applies to all things at all levels…including, unfortunately, Western civilization and the idea of America. As for Western civilization, it’s had a fantastic run. Claims of the politically correct and multiculturalists aside, it’s really the only civilization that amounts to a hill of beans. Now, it’s even riskier calling a top in a civilization than the top of a stock or bond market. But I’d say Western civilization peaked just before World War I. In the future, it will be a prestige item for Chinese families to have European maids and houseboys. As for America, it was an idea – and a very good one – but it’s already vanished, replaced by the United States, which is just one of 200 other nation-states covering the face of the Earth like a skin disease. That said, the U.S. peaked in the mid ’50s and has gone down decisively since 1971. It’s living on stored momentum, memories, and borrowed Chinese money. Let me bring this gloomy Spenglerian view of the world to a close with some happy thoughts. You want to leave them laughing. Not everybody went down with the Titanic. Looking further at the bright side: Just being born in America in the 20th century amounted to winning the cosmic lottery…an accident of birth could have placed us in Guinea or Zimbabwe. On the other hand, if I wanted to make a fortune in today’s world, I’d definitely head to Africa. But just as the Second Law dictates that all good things, like America, must come to an end, so must all bad things, like the Deep State in particular. That’s a cosmic certainty. We all love the idea of justice, even if most people neither understand what it is, nor like its reality. Finally, it occurs to me that, while I hope I’ve explained why the Second Law will vanquish the Deep State, I’ve neglected to explain how whipped dogs can profit from the collapse of Western civilization. The answer is that they can’t. Fortunately, parasites can only exist as long as their host. Which is actually a final piece of good news I want to leave you with.